2" Talalay Latex - The top layer of Talalay latex is cool and breathable. Offers great responsiveness and comfort. 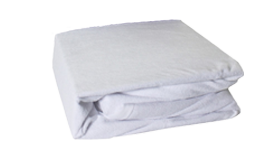 2" Energex Memory Foam - The middle layer of Energex memory foam offers excellent pressure point support underneath the top layer of cushioning. The top layer of Talalay latex is cool and breathable. Offers great responsiveness and comfort. The middle layer of Energex memory foam offers excellent pressure point support underneath the top layer of cushioning. TRU Lite Slumber hits the sweet spot between soft and firm. It’s luxuriously soft while still providing perfect support for your pressure points. It’s also an excellent choice for a guest bedroom that will host many different sorts of sleepers.